If you are feeling nervous about taking a CBT why not try a pre CBT lesson. The course is divided into 5 main sections on which you will be assessed. There is no time limit, but each one must be completed before you can move on. So just relax and take each section one at a time. It’s really not that bad! Once you have mastered the basic skills on our safe off-road site you will spend a minimum of 2 hours on the road with your instructor, followed by a de–brief at the end of the ride. This is classroom based. (Yeah – boring, we know – but very necessary!). The instructor will take you through what to expect during the course, as well as covering all the legal aspects of riding on the road. This is where you’ll actually get into contact with the bike. You’ll be shown the controls and will be taken through some basic maintenance checks necessary to your safety as a motorcyclist. You will be shown the controls of the bike, including correct use of the stands and how to start the bike. This is where the real fun begins! You’ll move onto an off road area to start riding. Starting off with learning how to use the clutch to take off and perhaps more importantly the correct use of the brakes to stop! This is followed by some exciting things like emergency stops and turns, road positioning and junction work. Now, it’s back to the classroom for a well-deserved break from riding. You will have a pre–road ride briefing, covering the Highway Code, how to stay visible, speed control, road signs and how to ride defensively. This is what you have been waiting for. You will be taken out on the road for a ride. Your instructor will start you off on quieter roads and then progress to busier roads, covering most riding eventualities such as roundabouts, traffic lights, junctions, hill starts and safe stopping and parking places. A full car licence gives you provisional motorcycle entitlement although you must check that this is visible on your licence. You need to ensure that it shows Category A provisional motorcycle entitlement on your licence or a Category P for a moped. If you passed your car test before February 2001 you are automatically entitled to ride a moped without L Plates or taking the CBT (although it is always advisable to take this introductory training). You can also carry a pillion passenger. If you passed your car test after February 2001 you automatically have provisional moped entitlement but you will need to take a CBT. The certificate is valid for moped use for the duration of your car licence. You will also be allowed to ride without L Plates and carry a pillion passenger. 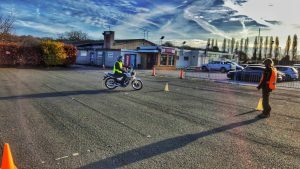 If you hold a provisional motorcycle licence (Category A) or a full car licence issued after 1st February 2001 you will need to successfully complete a CBT Course before riding any moped, motorcycle or scooter on the road. You need to apply for a Provisional Category A licence here. If you have a full car licence ensure that it has provisional Category A entitlement. If you have a provisional licence issued at 16 years – make sure that it includes Category A entitlement and CBT. If you hold a full car licence issued before 1st February 2001 you are entitled to only ride a 50cc restricted moped on the road without L plates and you can carry a passenger.